Our premium knot cup construction features high strength steel components that are locked together as a unit.. 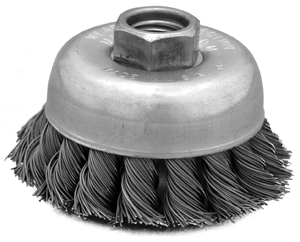 This eliminates slippage, provides an aggressive and secure positive drive and excellent rotational balance. 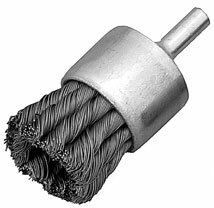 Stocked in carbon and stainless steel wire in 2-3/4”, 4” and 6” diameters. 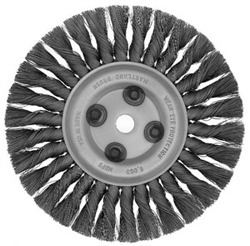 The crimped wire cup brush is engineered for light and medium duty applications.. They are manufactured with a premium quality wire, are perfectly balanced and lightweight to minimize vibration and operator fatigue. 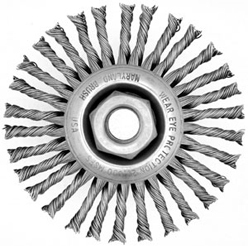 These are available with carbon and stainless steel wire in 2-3/4”,4” and 6” diameters. 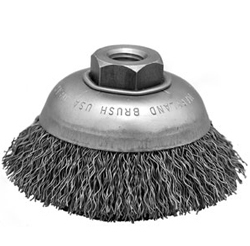 MBC provides a wide range of quality end brushes for hard to reach areas. 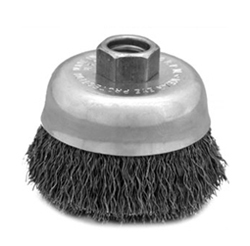 Engineered to operate at higher RPM’s, these brushes provide more effective brushing action where space limitations is a factor These general purpose brushes are permanently mounted on ¼” steel stems . They are available ½”, ¾” and 1” diameters in carbon and stainless steel wire. Other variation of this type are available with different fill materials, trim lengths and modified shapes.